Spinning a globe on its axis, or viewing satellite images of the earth, the immense surface area of water is deceiving. Most of the earth is covered by water. But two-dimensions belies the three-dimensional truth. The earth is a sphere slightly flattened at the poles. If it was possible to drill a core through the earth, it would be 7,918 miles long. The earth's diameter is about 7,918 miles across. If every water molecule on earth was contained by a sphere, the sphere would be much smaller than the earth sphere. Visualized as a sphere, earth's water would be 860 miles across. Volume of all earth's water as compared to the earth's volume. 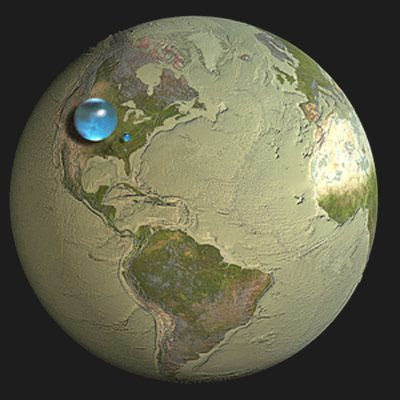 The tiny blue sphere located east of the much larger total water sphere represents all of the fresh water found in the ground, lakes, swamps, and rivers. The fresh water sphere is 169.5 miles in diameter.